Just came across this report on Celebritybuzz which reveals how our celebs look mighty fair and with no blemish at all even when we all know the real colour of skin JESUS blessed them with lol..
"Have you ever wondered how our celebrities just turned white over night. Top on the list is Tonto Dikeh, but right now, the list is endless. Bleaching is definitely not a new thing. We can authoritatively reveal to you the secret behind these celebs new look. The new bleaching technique is in form of Injection/ Pill. You inject into the blood-stream and then take some pills. Interesting, this injection used for skin lightening, is part of the treatment for HIV and Cancer patients. The injection/pill gives a much brighter, even toned complexion when taken regularly. full details of this skin lightening injection/pill- Gluthathione will be examined. Glutathione is a very good anti-oxidant and very effective whitening if you will take it on a greater dosage. It is an anti-oxidant that cleans the liver, takes off free-radicals and helps the brain too. It is safe for everyone whatever age is. It is given to cancer and HIV patients and in other diseases where glutathione is depleted. In HIV, glutathione levels are low and this contributes to immune deficiency as the lymphocytes need normal levels of glutathione to function properly. Glutathione is produced by the body and with age, the levels fall. Low levels or the Lack of glutathione leads to liver failure. It also leads to immune system failure and cells die from oxidative stress. It was discovered that patients on high dose Glutathione therapy had significant skin lightening as a side effect. Now this has become a fast growing treatment for cosmetic purposes. Injectable Glutathione has become more popular than tablets and are given intravenously 2 – 3 times a week for about 6 months. The digestive tract is bypassed and the maximum concentration reaches the target cells. Results are more dramatic in lighter skinned individuals and it is common to augment results with chemical peels. Glutathione is also known for its anti-aging benefits. Glutathione acts to lighten skin by inhibiting Tyrosinase the enzyme responsible for the production of the pigment Melanin without destroying the pigment producing cells known as Melanocytes. The most advisable dosage is 10-20mg/kg BodyWeight. To use glutathione as an anti-oxidant and for whitening it has to be 20-40mg/kg/BW. Example: 50kg x 20mg = 1000mg. You have to take it with Vitamin C in ascorbic acid form to be able to maximize its whitening effect. There are definitely no side-effects of using gluta, you know why? Because its ability to whiten your skin is already its side-effect. There is also no harm in its prolonged use. Its advisable to take gluta with meal and never take it with liquor or any alcoholic drink. While taking this, you wont really become sensitive but you have to at least put sunblock lotion or cream to exposed parts of your body and your face. The active ingredient, Glutathione is a powerful antioxidant that naturally occurs in the body and is capable of protecting the skin as well as the cornea, lens and retina of the eye against radiation damage. However, the use of glutathione in high doses for cosmetic purposes is a non-regulated procedure which could be fatal if not properly used. Glutathione is a drug and must be administered by a doctor or registered nurse. Side effects include nausea, vomiting, abdominal pain, liver failure and death. The quest for lighter skin could cost you your life. This unregulated use of high dose glutathione is relatively new and time will tell what side effects may occur in the long term. 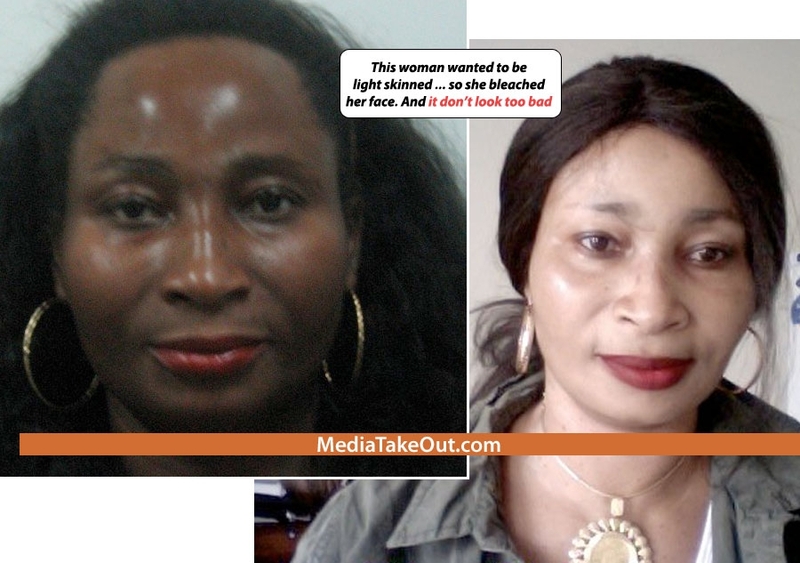 she is not nigerian but a ghanian woman who used hydroquinon and steriods to lighten her skin. Get your facts right and stop publishing unconfirmed stories. sheeze. Google hydrogold and she come up or serch her on you tube and see her video on how she transformed. I am so tired of all the negative publicity nigerians are getting re: Dencia and now this when the women in question are not even nigerian. Sweetheart it pays to read before jumping to conclusions that was a report published somewhere else which I only reblogged and pictures do not necessarily represent the actual celebs the article was addressing.. Does every dermatologist bleach skin? No I dont think they do,they are specialists for skin problems and skin issues.. Darling there is no need for swear words if you were patient enough you would have realised I dint write that I only rebloggled an interesting article with the link right up there in the first sentence..
you must have been too livid to see that?? Love The Skin Your In!!! Stop Bleaching Please!!!! Ok they are listening! lol..